*Luke tests his strength/endurance/abilities with the help of NY Jets coach Todd Bowes; a Nike scout is impressed, and Fish starts negotiating a deal. *Mariah returns to work to find her desk now occupied by Detective Nandi Tyler, an old school frenemy, who is assigned the Arturo case while Misty is restricted to light duty. She tries to interrogate Arturo herself anyway, but is interrupted by the arrival of his lawyer (provided by Mariah) who has made his bail. *Bushmaster pulls out the bullets partially imbedded in his chest, then goes for a walk through the neighborhood. He has a talk with a man running a restaurant (named after Bushmaster's mother) about needing more nightshade, and saying that Harlem is his birthright not Mariah's or Luke's. *James Lucas shows up at Pop's ostensibly looking for a haircut, but Luke gives him the brush-off, to Claire's disappointment. *Luke tries to get Cockroach's location from his (abused) girlfriend, Drea Powell, but then gets a tip from Drea's neighbor that Cockroach is running games/a club out of a warehouse. *Mariah's reelection campaign strategist recommends she reconcile with her daughter, Tilda, for the good publicity, but her first attempt (at Tilda's holistic medicine shop) is rebuffed. *Shades and Comanche try to collect the $20 million from Arturo, but he says he'll only pay up after Mariah's lawyer gets him completely cleared of charges not just free on bail, and when he crudely insults Mariah, and Mariah & Shade's relationship, and raises the threat that he can rat Mariah out for immunity if he doesn't get what he wants, Shades shoots him in the head. *Luke confronts Cockroach at his warehouse club, but he shoots Luke with enough firepower to push him out of the window, landing hard enough on a car roof to dislocate his shoulder, and Cockroach flees. Back at Pop's, Claire helps him get his arm back in socket, and argues with him about his unwillingness to deal with his father. *Bushmaster visits Tilda's shop for a list of ingredients which Tilda recognizes as being for Obeah rituals, but sells him whatever he wants after he intimidates her. *At Harlem Paradise, Shades tells Mariah that someone from the Yardies (not Nigel) has reached out to with an offer for the guns, and though it's not the entire $20 million they want, he'll get the rest somehow. Tilda arrives and tells Mariah she's willing to give her one chance at reconciling. Comanche tells Shades it looks like he'll be losing his prime spot in Mariah's affection. At the bar, Nandi surveils the club. *Claire listens to James preach, telling a parable of the two wolves. Elsewhere, Bushmaster lights up his mixture of ground herbs and inhales the smoke, and his bullet wounds heal instantly. Back at Drea Powell's, Cockroach returns and beats Drea up, believing she told Luke about the club. Luke smashes through the door (having been called by Drea's neighbor), and proceeds to beat Cockroach senseless, only stopping himself when he sees Drea and her son cowering in fear of him. I found the arguments between Claire and Luke to be... ham-fisted. I feel like I know these characters and that's not how I thought they would ever argue. It's like every reply is an escalation, when you know both of them are very reasonable people with calm demeanor. I'm enjoying the action so far. Although some scenes do feel too long, like the musicians at the club. I like the music, but having scenes only focusing on the musician interspersed with the main characters doing stuff felt like padding to me. The fighting is pretty great now that capoeira is also in the mix! Also, the quick cuts due to Luke's power is like 10 times better than the quick cuts in Ironfist, where it's just regular fighting (yes, I'm still sorely disappointed with that show). I was wondering how Shades really feel about Mariah, but I guess that bullet to Arturo's head answers that. Also, it was in this episode that I realized they were calling Shades' friend "Comanche", which I realized was the same guy that helped beat up Luke when he was in Seagate. So when Luke stared him down at Harlem's Paradise last episode, I completely missed the significance of that quick exchange. I usually get lazy about posting unless I'm really really motivated to talk about an episode (see: my lack of posting for the last few episodes of Supergirl vs posting for The 100 which barely gets comments). But I gotta talk about episode 3 so I'll make one now! I was put off by Claire arguing that Luke should forgive/reconcile with his father -- I've seen it said over and over in advice columns and here on Mefi that being estranged from an abusive parent is a sometimes the best option for one's mental health, and people from healthy families are overstepping/misguided when they trot out the "but they're faaaaaamily" argument. While Claire was arguing that Luke needed to do it for his own sake rather than for James', it still rubbed me the wrong way. Yes, I also thought her bringing up his dad was super random. I want to follow up your point with info from the third episode too, so I'll address it there. -"Mariah’s daughter, Tilda, is based on the character Nightshade from Captain America #164 (1972). There her mastery of chemicals allow her to develop serums that turn people into werewolves and then control them using hormones." -"Commanche ... first appeared in Luke Cage season 1, but only in flashback. Now he’s part of Shades’ operation. He first appeared in Luke Cage: Hero for Hire #1 (1972) and was an archer." 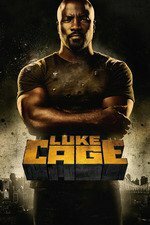 -"Ben Donovan reappears in this episode – the character previously appeared in the first season of Luke Cage, but he first appeared in Daredevil season two as the Kingpin’s preferred lawyer. In the comics he’s known as Big Ben (presumably because he’s able to clock people*) and first appeared in Heroes for Hire #14 (1973). *I know, Big Ben is the bell. But I couldn’t exactly say “because he’s also a giant bell” without sounding rude." Goddamn, I hope Luke's going to pay Drea for the damage he did to her apartment after he personally sweeps up all the broken things. That honestly pissed me off. That made me mad too, desuetude. Luke doesn't even have enough money for his endless hoodies, much less to pay people for the things he breaks!